Post-tensioned concrete is widely used in civil engineering structures such as bridges, dams, reservoirs and offshore structures. The Freyssinet multistrand system, named C Range (C for Compact System) has been designed and developed with such structures in mind. The C Range System accommodates both external prestressing, which is gaining wider usage particularly in bridges, as well as the more traditional internal prestressing. The C Range was recently approved by the EOTA (European Organisation for Technical Approval) for use in all European Countries, according to ETAG, the most stringent guidelines worldwide. Over the past 30 years, the rapid development of cable stayed structures, in particular cable stayed bridges, has indicated a growing interest in this type of structure. Modern stay cable systems using individually protected strands and anchorages derived from prestressing technology, represent the state of the art in bridge engineering. Isotension, the Freyssinet worldwide patented stressing method, is the result of considerable investment into research and development as well as experience from the involvement in the construction of over 200 cable stay bridges. This method facilitates strand-by-strand erection and virtually eliminates the need for heavy erection equipment. Freyssinet Stay Cable Technology leads the world in this form of bridge construction and incorporates decades of experience gained from the design and construction of some of the world's longest span cable stayed bridges. 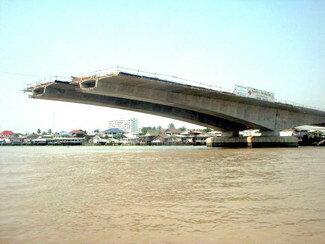 Kanchanaphisek bridge crossing the Chaophaya riverin an industrial area links between Bang Phli and Suksawat. 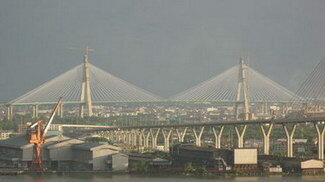 The structure is a symmetrical cable-stayed bridge with two 950 m long pylons and a 500 m main span. The structure has six traffic lanes. 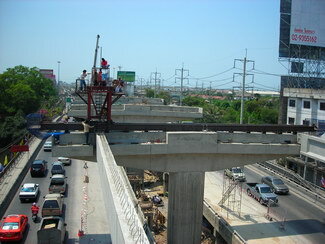 After supplying the 168 white stay cables of the main bridge, Freyssinet and Freyssinet Thailand completed the installation and adjustment work in June. The work lasted 12 months and involved 55 people. 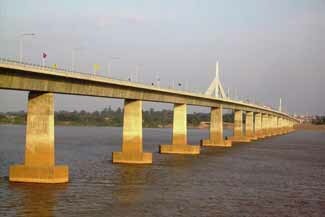 These projects commonly require the design, fabrication and operation of temporary works items including but not limited to erection gantries for precast segment erection, formwork travellers for balanced cantilever bridges and launching girders for span by span construction of bridges and viaducts. 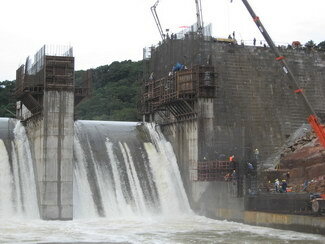 Such projects are not undertaken without the availability of considerable technical expertise and experience. This is accomplished with the design and consultancy organisations that are encompassed by the Freyssinet Group who in turn employ some of the acknowledged world leaders in such fields of engineering. The use of engineering technology within the group and of our Strand Jacking Systems has resulted in the emergence of a heavy lifting division that is world-renowned. Within the Freyssinet Group, heavy lifting projects are centralised by the Swiss based HEBETEC company, operating jointly with local Freyssinet subsidiaries. The range of activities covers incremental launching of bridges, erection of offshore platforms, installation of heavy engineering structures including boilers and towers and steel hanger roofs weighing up to 25,000 tonnes.